While short-term news emanating from the global energy sector was universally negative in the waning months of 2014 as the price per barrel continued to plummet below $60, the inevitable truth of oil & gas is that prices will rise again, and the long-term picture for this extinguishable natural resource is decidedly bullish. The oil and gas industry is very well accustomed to hard cyclical markets, markets that are defined not only by supply and demand but increasingly by hard-to-predict forces of politics and international gamesmanship. 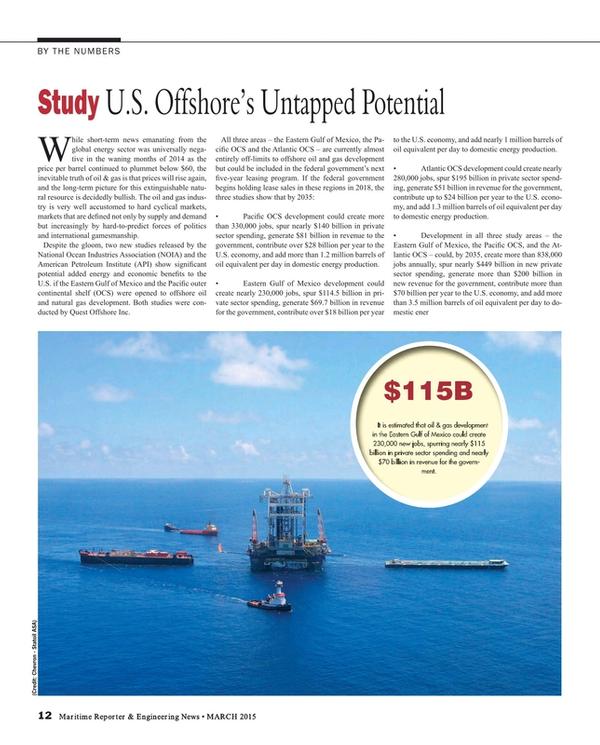 Despite the gloom, two new studies released by the National Ocean Industries Association (NOIA) and the American Petroleum Institute (API) show significant potential added energy and economic benefits to the U.S. if the Eastern Gulf of Mexico and the Pacific outer continental shelf (OCS) were opened to offshore oil and natural gas development. Both studies were conducted by Quest Offshore Inc.